Abrahm Lustgarten. Flypmedia. Issue 21. January 16-29, 2009. "Drilling for Truth". Page 11. Includes photos, graphics and videos. Experimental Flash based interactive online magazine. Last updated Fall 2009. On April 19, 2010, Flyp announced that it will close. 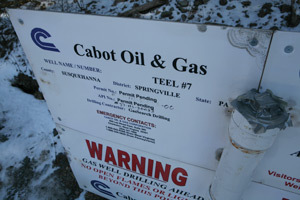 ...The incident is the latest in a series of environmental problems connected to Cabot’s drilling in the Dimock area. Last winter, drinking water in several area homes was found to contain metals and methane gas that state officials determined leaked underground from Cabot wells. And in the spring, the company was fined for several other spills, including an 800-gallon diesel spill from a truck that overturned. Site includes extensive background information. 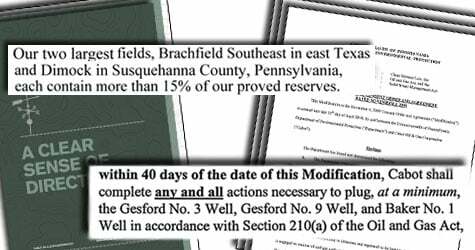 Series: Buried Secrets: Gas Drilling's Environmental Threat. Drilling companies assert that the destructive forces unleashed by the fracturing process, including the sometimes toxic chemicals that keep the liquid flowing, remain safely sealed as much as a mile or more beneath the earth, far below drinking water sources and the rest of the natural environment. More than a year of investigation by ProPublica, however, shows that the issues are far less settled than the industry contends, and that hidden environmental costs could cut deeply into the anticipated benefits. The technique used to extract the gas, known as hydraulic fracturing, has not received the same scientific scrutiny as the processes used for many other energy sources. After three chemical spills in the past nine days, and following a history of environmental problems over the last year , Pennsylvania officials have ordered Cabot Oil and Gas, one of the most active natural gas companies in the state, to stop its hydraulic fracturing operations in Susquehanna County pending an intensive review. "The department took this action because of our concern about Cabot's current fracking process and to ensure that the environment in Susquehanna County is properly protected," DEP north central regional Director Robert Yowell said in a news release distributed this morning. Abrahm Lustgarten of ProPublica takes FLYP readers on a journey through Sublette County, Wyoming to take a tour of the wells and hear the voices of residents and experts on the issue. Anecdotal evidence has been criticized by Gas Industry advocates in the debate over the inadequately funded EPA study. There have been many anecdotal reports of fouled wells and air pollution, unknown risks to chemical exposure and hydrogen sulfide, and methane leaking from gas compressors captured on infrared film. Cornell professor Robert Howarth has criticized claims that natural gas is "clean-burning". There have also been no studies on the cost benefits of gas drilling. See: Drilling for Truth and other articles by Lustgarten. by Abrahm Lustgarten, ProPublica - April 7, 2010. A federal study of hydraulic fracturing set to begin this spring is expected to provide the most expansive look yet at how the natural gas drilling process can affect drinking water supplies, according to interviews with EPA officials and a set of documents outlining the scope of the project. The research will take a substantial step beyond previous studies and focus on how a broad range of ancillary activity – not just the act of injecting fluids under pressure – may affect drinking water quality. The oil and gas industry strongly opposes this new approach. The agency’s intended research "goes well beyond relationships between hydraulic fracturing and drinking water," said Lee Fuller, vice president of government affairs for the Independent Petroleum Association of America in comments (PDF) he submitted to the Environmental Protection Agency. See 22 page Powerpoint, Hydraulic Fracturing Applicability of the Safe Drinking Water Act and Clean Water Act Science Advisory Board Discussion.(2010). by Abrahm Lustgarten, ProPublica - April 16, 2010. More than 15 months after natural gas drilling contaminated drinking water in Dimock, Pa., state officials are ordering the company responsible -- Houston-based Cabot Oil and Gas -- to permanently shut down some of its wells, pay nearly a quarter million dollars in fines, and permanently provide drinking water to 14 affected families. The order is among the most punitive in Pennsylvania's history and reflects officials' frustrations over a string of drilling-related accidents. The record of spills, leaks and water contamination in Pennsylvania -- several of which are tied to Cabot -- has spotlighted the environmental risks of drilling for natural gas across the country, jeopardized development of the massive Marcellus Shale resource deposit, and contributed significantly to actions by both Congress and the U.S. Environmental Protection Agency to bolster federal oversight of drilling. "The events at Dimock have been the black eye for the industry and have also been a black eye for Pennsylvania," the state's chief environment official, John Hanger, told ProPublica. "It's been an enormous headache. If Cabot doesn't get this message, the company has got an amazing hearing problem." 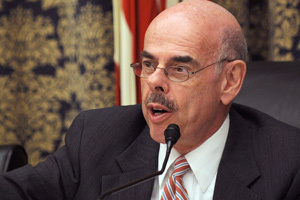 Rep. Henry A. Waxman, D-Calif.
"Two of the largest companies involved in natural gas drilling have acknowledged pumping hundreds of thousands of gallons of diesel-based fluids into the ground in the process of hydraulic fracturing, raising further concerns that existing state and federal regulations don't adequately protect drinking water from drilling." When Benjamin Grumbles was assistant administrator for water at the Environmental Protection Agency in the George W. Bush administration, he oversaw the release of a 2004 EPA report that determined that hydraulic fracturing was safe for drinking water. Then he watched as Congress used those findings to bolster the case for passing a law that prohibited the EPA from regulating fracking under the Safe Drinking Water Act. In two interviews with ProPublica -- the first on June 29, 2009, soon after he left the EPA, and the second on March 5, 2011 -- Grumbles ponders the criticism leveled at the 2004 study and suggests that it's now time for Congress and the EPA to take another look at hydraulic fracturing. Our questions, and his answers, have been combined and edited for length to the version you see here. Grumbles is currently on the board of the Clean Water America Alliance, a group focusing on water sustainability issues. He has also served as head of Arizona's Department of Environmental Quality. Congress isn’t going to regulate hydraulic fracturing any time soon. But the Department of Interior might. For starters, Interior is mulling whether it should require drilling companies to disclose the chemicals they use to frack wells drilled on public lands, and already the suggestion has earned Interior Secretary Ken Salazar an earful. "The public has a right to know what toxins might be going into the ground near their communities, and what might be leaking into their drinking water," said the letter, which was sent by the three initial sponsors of now-stalled legislation to regulate fracturing, Hinchey, Rep. Jared Polis, D-Colo., and Rep. Diana DeGette, D-Colo.
See: ProPublica Series. "Buried Secrets: Gas Drilling's Environmental Threat".